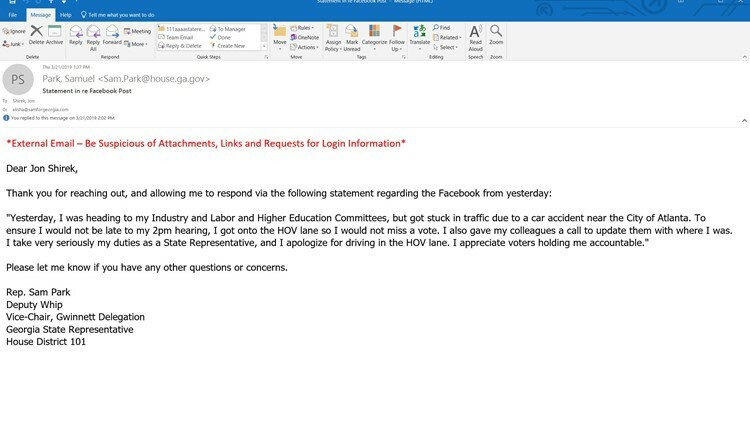 State Rep. Sam Park (D-Lawrenceville) said he was driving in the HOV lane and talking on his phone because he was stuck in traffic. ATLANTA — Atlanta traffic is nothing to laugh at and, on the Downtown Connector, there are no secrets. One year after the state legislature voted to prohibit drivers from holding cell phones while driving, an 11Alive viewer caught someone red-handed – and that driver happened to be a Georgia state legislator. Shumake said he recognized the lawmaker because he had an official tag on his car – SR 101, for "State Representative, District 101." He noted that the hands-free law does not mean hands-free steering. “I just thought, this is absolutely ridiculous,” Shumake said. 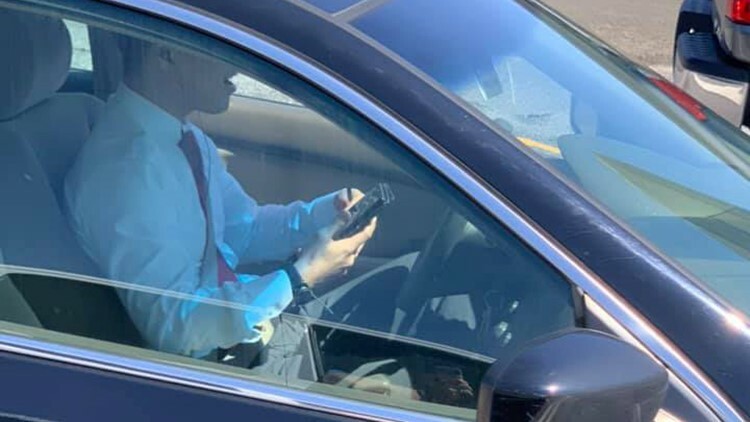 Rep. Sam Park (D-Lawrenceville) was caught by another driver talking on his cell phone, hands off the wheel and driving in the HOV lane by himself. Rep. Park was not caught by police, but he was caught by Shumake's camera, and when Shumake posted the photos on his Facebook page, commenters were quick to judge and "convict" Park, showing no mercy. Park, who is in his second term at the State House, at first told 11Alive that he would be available to talk about the incident during a break in House proceedings but changed his mind and declined to be interviewed. "Yesterday, I was heading to my Industry and Labor and Higher Education Committees [at the State Capitol in downtown Atlanta], but got stuck in traffic due to a car accident near the City of Atlanta. To ensure I would not be late to my 2pm hearing, I got onto the HOV lane so I would not miss a vote. I also gave my colleagues a call to update them with where I was. I take very seriously my duties as a State Representative, and I apologize for driving in the HOV lane. I appreciate voters holding me accountable." According to the state's hands free law, there are no such exemptions for state legislators. The legislature approved the cell-phone driving restrictions a year ago because so many grieving families demanded action to stop wrecks caused by distracted drivers talking and texting on cell phones. When an early version of the bill came to a vote, Park voted to support it. But, for the final vote, Park was a no-show and excused from voting. Shumake admits that he has some explaining to do as well – because he took the cell phone photos while he was driving, and the same law prohibits drivers from having cell phones in their hands for any reason, including to take photos. So, Shumake considers his photos to be a legal and approved public service – reminding one state lawmaker to comply with state law.